This morning is partly cloudy. The magical crane has not let much mist out of the weather box. The guests get up before Captain Bill today. They are eager for the day’s activities and enjoy the peaceful moments aboard ship in the morning. Don, Mariana, Jennifer and Peter are among the early birds. There is not much talk. Each person takes their hot drink to a special spot and either contemplates the scenery or writes notes about the trip. Our breakfast is oatmeal porridge with toast. The porridge is smooth and good. After breakfast, the crab trapping team goes out to collect their catch. Jane prepares herself with a short crab collecting dance. The First Nation people believe that the successful harvester communes with the spirit of the thing which is being harvested. They return with one successful crab pot catch and we have plenty crabs for today’s lunch. Jane’s dance must have helped. About 10 AM we begin kayaking in the Broughton Archipelago. The paddling partners are changing. After much discussion about gender bias, we decide as a group to have mixed male-female paddling teams with the gals seated in the stern position. The logic is as follows: the bow paddler provides the most effective power. The stern paddler uses the foot pedals to steer and may have less powerful paddle strokes. So the guys should be in the front and the gals should be in the stern. Sharon thinks this is a gas and takes a group picture of the five tandem kayak teams. So we have Don and Jennifer – now named Team Canada, Kris and Shanna – Team California, Nathan and Nancy – the Boston – Seattle or BS team, and the two Madison teams – Peter and Jane, Frank and Mariana. On our morning paddle we explore the sea life along the shore line. 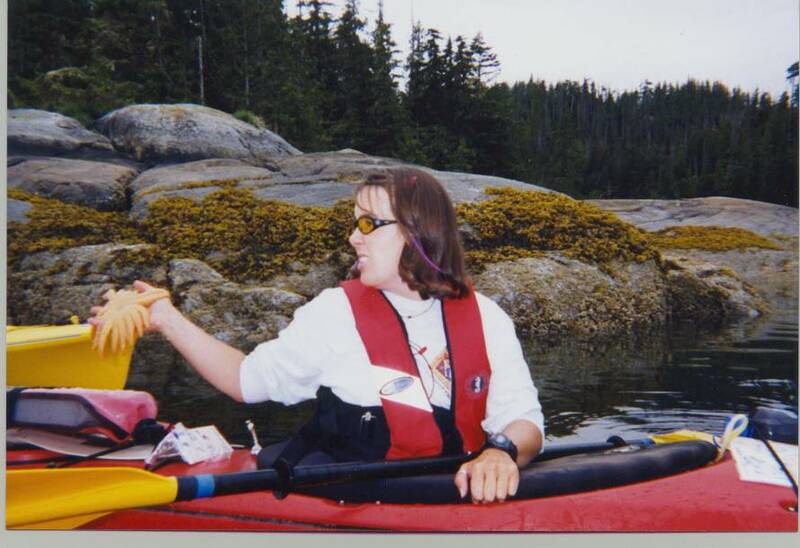 We slowly paddle along the shore staring down into the water while Lorna describes what we are seeing – seastars (formerly known as starfish) in colors of orange, purple and white, sea jellies (formerly known as jelly fish), and sea anemones that grow out from rocky surfaces underwater. Lorna is quite a good teacher. She collects objects from the sea and passes them among us. Kris wears a seastar on his cap for a photo opportunity. Lorna has also prepared a daily naturalist sheet which provides detailed information about a plant or animal that we might see that day. We continue our paddling down Misty Passage between Tracy and Baker Islands. Our destination is a midden on Insect Island. A midden is a place where the First Nation people have lived and deposited oyster and clam shells on a beach. The beach becomes white from the thousands or millions of shells that are there. One of the purposes of the white beach is to provide a layer of protection for the village beside it. Night raiding parties would have to cross such a beach and the outline of their figures could be seen easily with the white beach as a background. We pull our kayaks up on the white shell beach. Captain Bill has arrived in his skiff with the bucket of crabs and the rest of lunch. He prepares a cedar wood fire and boils a pot of water for the crabs. In addition to the fresh crab legs, we have candied salmon, smoked salmon, cold salmon, fire-warmed garlic bread and a salad. The feast on the beach. Bill, Jennifer (hidden) Nancy and Frank. We sit on the beach and enjoy the feast. It is a challenging task to eat all of this food, but we are able to do it. Captain Bill tells us it is okay to throw the pieces of crab shells on to the beach, another addition to the midden. 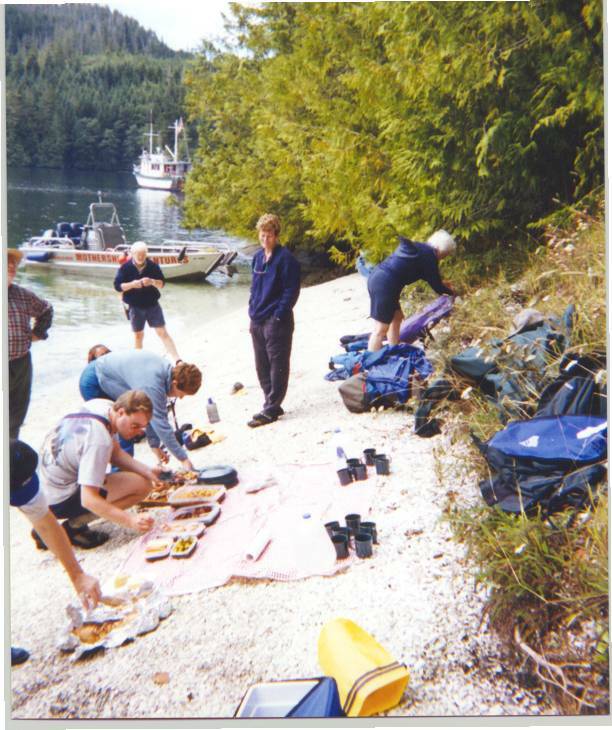 After lunch, we launch our kayaks and paddle along Old Passage – a narrow waterway between Insect and Baker Islands. We meet the Columbia and load our kayak gear about the ship. 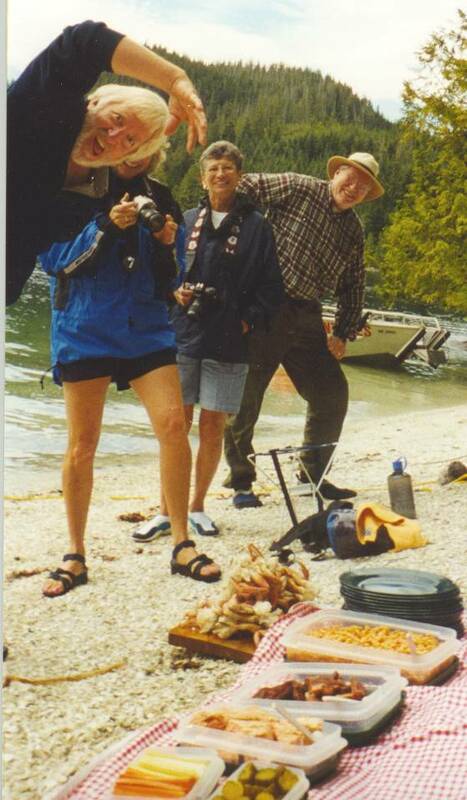 We then motor to Echo Bay Marina a local oasis in this wilderness. This village is built on wharves and consists of floating rental houses and moorings for fishing boats. There is a functioning marina and a few arts and crafts stores. We visit the latter first and make a few purchases. The highlight of the trip is a visit to the marina and the purchase of real ice cream bars. This is the first ice cream that we have had in many days. The area is named for a large rock outcropping that forms one side of the harbor. The flat surface of this rock combined with the elliptical shape of the harbor produces an excellent echo. Sharon purchases fresh fruit and vegetables and several loaves of home made bread. After pillaging this village, we return to the Columbia and proceed down Raleigh and Penphrase Passages. We see several more fish farms. Their similarity in appearance makes us joke that we are going around in circles and passing the same fish farm again and again. Navigation in this area can be very challenging because of the similar appearance of the waterways and islands. In the distance, we see the snow capped Mt. Stephen. The water quality changes as we approach Kingcome Inlet. This inlet brings fresh water and glacial silt to the sea. The water color changes to a blue grey and there appears to be layers in the water. The Columbia runs relatively quietly. Its diesel engine is among the best. Captain Bill says he bought the boat because it had such a good engine and it has not disappointed him. The Columbia does not crash through the waves or wallow from side to side. The passengers feel at ease while we are motoring. We turn up Kingcome Inlet,make a sharp turn around Bradley Point and enter a bay on the north side of Gregory Island. Here Captain Bill anchors Columbia. Tonight’s dinner is fresh halibut with wild rice. The halibut was caught locally a few days ago and fast frozen shortly after it was taken. Sharon got it from a neighbor in Sointula and brought it along for our dinner. She cooks it to perfection, – moist, mild and mouth–watering. Sharon brings out a surprise birthday cake that she had purchased in Echo Bay. The surprise is that there are no birthdays or special events to celebrate, so we celebrate this very successful trip. The cake is very good. After dinner we watch for the full moon but do not see it. Clouds and hillsides block our view. Many of us go to bed early after such a full day, with a full bellies. Later, Jennifer and Mariana catch sight of the full moon through their port holes. This night is not as peaceful as most. The boat swings a bit on its anchor. About 3 AM, a sudden clunk awakes everyone except Nathan, Peter and Jane. 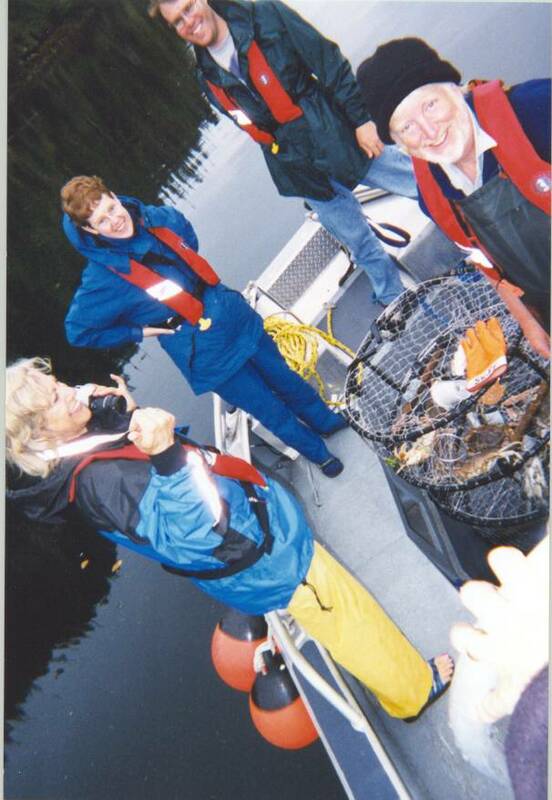 Several of the passengers wonder what has hit the boat, but Captain Bill and Sharon do nothing. So they assume all is well and go back to sleep.